The owner of Big Ten Rentals wanted that large sidebar on the left showing a brief list of some of the thousands of items for rent. At first, we created that large menu with multiple pop-out options. This isn’t the best for mobile and that entire sidebar was stacked down at the bottom with just a mass of text that we believe most people never read (thanks to heat maps we could verify this). So we changed that by removing the excessive pop-out options that were a huge load time killer. We added small icons on the buttons and actually saw an increase in performance. Plus the user experience was enhanced because most users simply don’t want to read all of that text. Pictures are much more user-friendly for the user. The previous website was far from search engine optimized. The Google Analytics showed that it had been on the decline for years and honestly the company was hurting for new sales. 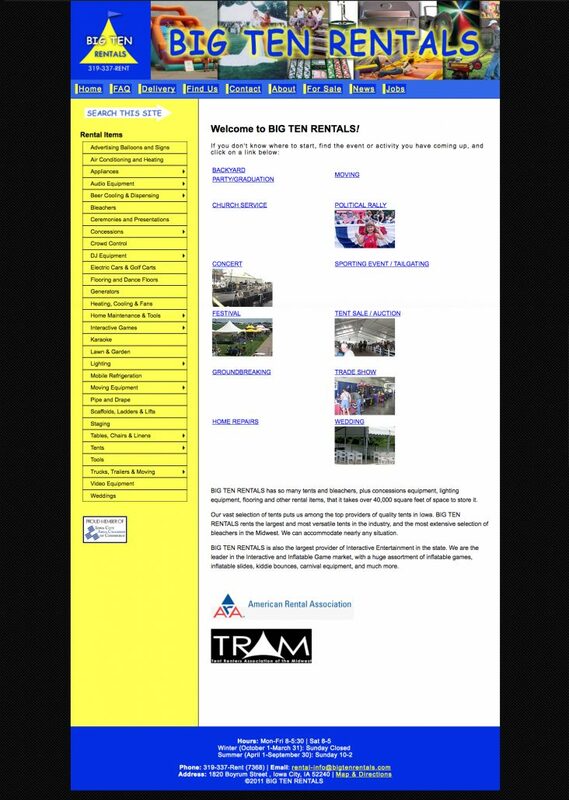 In our opinion, the previous website designer (now retired) ended every rentable item with an image. Text on images was not indexable or searchable by the major search engines back then. Even today Google usually doesn’t use OCR (Optical Character Recognition) software on images on sites as indexed information. So the original site missed out on almost every aspect of being found. We changed that by giving every item its own page with information and images on each page about that item. 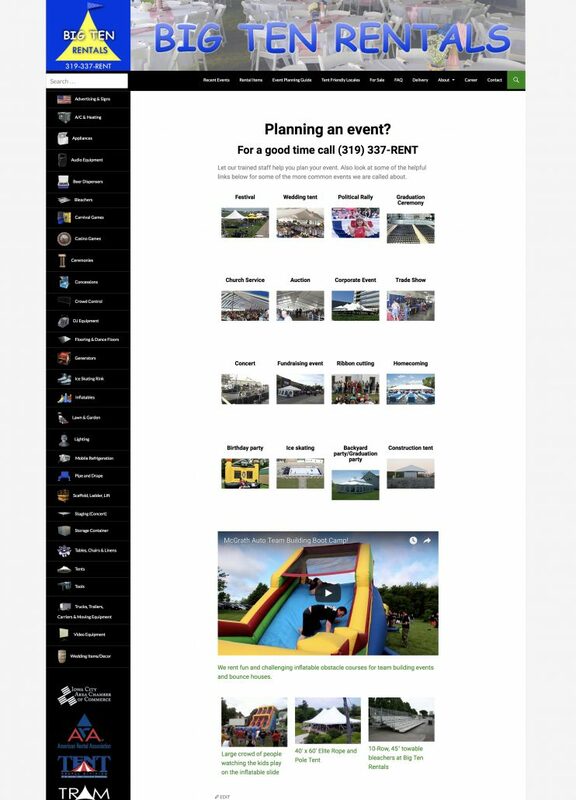 The previous website wasn’t adaptive or even remotely mobile friendly. We rectified that by moving over to WordPress. We added an SSL to keep the site secure. This is becoming an even more important ranking factor with Google. This is new technology as of late 2016 and it is backed by Google. This site is still in beta, but the almost-instant load pages people seem to like it thus far. This company is now a multi-million dollar company. BTR has been seeing 35% increases year after year since our new website was launched. Our client can’t be happier! This site has seen a 207.26% increase in traffic in the United States to BigTenRentals.com for full year traffic from 2013 vs. 2016. From Google Analytics, Keyword analysis to heatmaps Big Ten Web Design can handle it all. See how Big Ten Rentals previous website’s traffic back in 2013 vs. our new website that was up and running for all of 2016. Sessions were up 212.85%, Users were up 222.69%, Pageviews were up 217.15%. This all is reflected in the bottom line of the company. Lets just say they are one happy client!